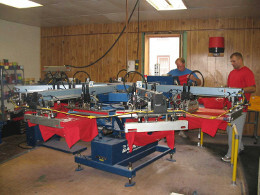 Major League Screen Printing & Embroidery, Inc. is more than just a group of salespeople who process orders. 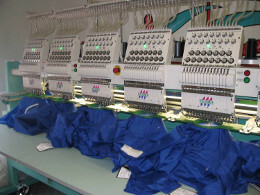 We are a fully integrated screen printing and embroidery company. Because we use our own on-site facilities, you deal directly with the people who customize your product. Family owned and operated since 1991, our goal is to deliver a quality product just how you ordered it, with fast service and low prices. As an ASI company, we have a seemingly endless array of products from which to choose. With low minimums for screen printing and no minimums for embroidery and digital printing, we can produce a custom decorated product for almost anyone's needs. Give us your logo, idea or sketch and our in house graphic design department will develop it into a brilliant printed or embroidered design. To ensure your satisfaction, you will see a proof of your artwork before we print and a sample swatch before we embroider. Major League can also help with the development and implementation of your saftey program, incentive program, company outing, trade show or golf tournament. If you have something else in mind, we can help make it happen. We can even create a custom online store for your company, school or organization. Please join our family of satisfied customers and find out why Major League has quickly become one of the industry's premier providers of decorated apparel and promotional products. Thank you for visiting our internet site. As a pro-active company, we want to give you the opportunity to stay in touch with our services and our offers. We are always making an effort to present you with as much of our spectrum of products on-line as possible.